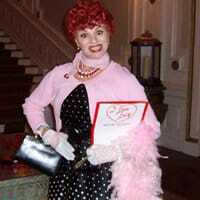 Invite Lucille-Lucy Ball Look alike Impersonator to your next event. She is always a huge hit at every event she is invited to. Her quick wit and comedy will make your event great and loads of fun. A “dead ringer” for the beloved Comedian. This professional actress, stand up comic, and comedy writer uses all her talents to create the beloved characters of Lucille Ball. Lucille Ball impersonator is excellent for corporate & private events, company picnics, trade shows, clubs, fundraisers, & advertising. Provide your audience with photos taken with “Lucy” as souvenirs. This accomplished impersonator not only looks like the performer, she has captured Lucy’s voice and mannerisms as well. Lucille Ball Impersonator always makes every event more fun and everyone in attendance always loves her…..”I love Lucy” and everyone loves Lucy.